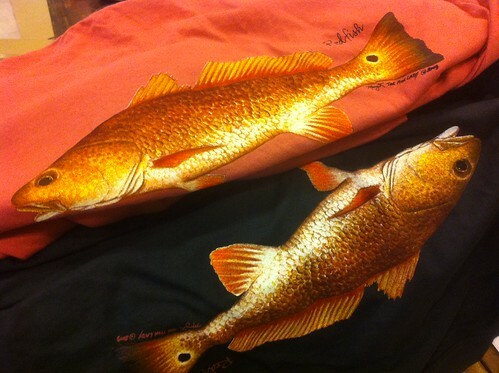 We now have short and long sleeved, “Mary K the Fish Lady” Backwater Angler fish t-shirts available in both short, ($23.00) and long sleeved, ($26.00) versions. 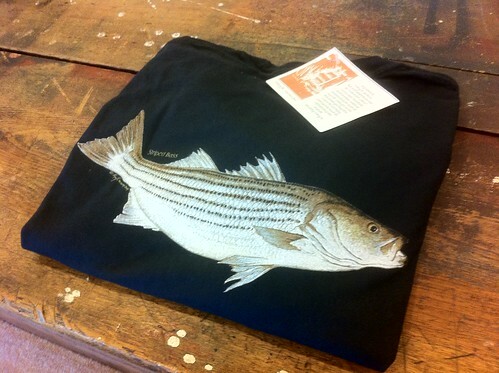 The shirts are screen printed with a beautiful fish on the back and the Backwater Angler logo on the front left chest. They are pre-shrunk 100% cotton and are a bit oversized. We have sizes Medium, Large, Extra Large and a few XXL shirts in stock. If you have a Visa or Mastercard handy, give us a call at 410-357-9557 and we’ll have them shipped to your address in a jiffy. If you need a gift certificate for gear, fly fishing schools, tying lessons or guide trips, we are happy to email a gift certificate to you or a loved one during normal business hours: Weekdays (except Wednesdays) 10AM-6PM and Saturday and Sunday 8AM-4PM. All Backwater Angler shirts, including Rainbow, Brook and Brown trout, in addition to the new Rockfish and Redfish, are also available in Black in both long and short sleeves! This entry was posted in gear on November 29, 2012 by Theaux Le Gardeur.